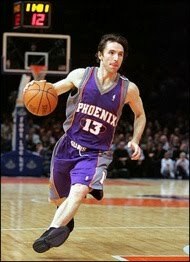 The Steve Nash Guide to Not Knowing ~ HELLO, my name is Blog! I was watching basketball at the time. When the game was over, the announcer stepped onto the floor to interview my favorite player, Steve Nash. "It's fascinating to watch you play. You're quick, you're scrappy and you're smart. And I never know where you're going to take the ball: Straight to the basket? Across the paint? Out to the three-point circle? I mean, how do you know where you're going to go?" "Yeah, but you're one of the best point guards in the league. Millions of fans adore you. And your numbers are off the charts. What do you mean you don't know?" If you don't know where you're going, nobody can stop you. That's the art of not knowing. And it's not only valuable for basketball players, it's also profitable for businesspeople. THE QUESTION IS: Are you smart enough to be dumb when it matters? Today we're going to explore a collection of ideas to help you convert strategic ignorance into a competitive advantage. 1. Reason is highly overrated. When I started wearing a nametag every day, there was no strategy. There was no agenda. It was just something I did. And what always amazed me was how how hard it was for certain people to wrap their heads around that. They simply couldn't accept the fact that I was doing something just the sake of doing it. In fact, some of them got outright angry, insisting that there must be a deeper motivation behind my actions. Nope. I just feel like wearing a nametag. What do you want from me? Years later, I read Flow by Mihaly Csikszentmihalyi. He named this type experience autotelic, or engaging in an activity or a creative work that has an end or purpose in itself. The other option is exotelic, which means doing things not because you enjoy them, but rather to accomplish a later goal. Which category describes your actions? The point is: Life's too short to surround yourself with people who a demand a reason for everything. Instead, stay in touch with your childlike sensibility. Never discard your playful spirit. And remember that sometimes, digging a hole is just digging a hole. You don't need to find the treasure when digging is the treasure. After all: Sometimes the best reason is the one you don't have. Are you motivated by the quality of the experience you feel or the quantity of the results you achieve? 2. Position yourself as the curious one. Not knowing has nothing to do with stupidity. It has everything to do with being aggressively skeptical and keeping a posture of incurable curiosity. That way, you can recognize the broken patterns most people miss. That way, you're the person who comes in, raises his hand and asks the dumb questions everybody else stopped asking long ago because they already know everything. Which they don't. They just haven't kicked their addiction to terminal certainty yet, and they need a fix. That's what I tell the clients who rent my brain: That I'm an outsider. A new pair of eyes. And the reason they're paying me is because I know nothing. Yes, it sounds like a counterintuitive position to take as a consultant. But in my experience, when you become known as a breath of fresh air, those who matter will come in droves to inhale. And they'll pay big money to sustain that high. Look: People are tired of listening to the same messages from the same people. Try walking in with some perspective. You'll walk out with a check. Remember: Sometimes it takes a person who knows nothing to change everything. How are you marketing your stupidity? "We all outgrow some of our beliefs. So instead of parading your own brilliance, try rebuilding your understanding. Otherwise certainty becomes an obstacle to the path toward truth." That's the cool part about not knowing: It engages a higher part of yourself. That's what keeps you mentally flexible. That's what allows you to trust the process. And that's what affords you the psychological freedom to pivot into new directions. Only from that space of openness, vulnerability and surrender can you make discoveries that change everything. The only problem is: Not knowing will drive your ego crazy. Even if you know you're wrong -- your head will make sure your heart never gets that memo. But that's an inner battle you have to fight. And it will annoy you to no end. My suggestion: For one week, stop being right. No arguing, no asserting your opinion and no spinning everything people say into another statement you disagree with. You'll be amazed how differently you treat people when you're not trying so hard to prove them wrong. What insecurity is being disguised by your relentless need to be right? 4. Ignorance isn’t just bliss -- it's boldness. I started my company the day I graduated from college. I wasn't ready, I wasn't smart enough and I had no experience. But I took the plunge anyway. Because I knew that if I waited until I knew what I was doing, I never would have done anything. That's the advantage of not knowing: It gets you going. And as long as you have the right mindset, jumping doesn’t have to be a reckless endeavor. Risky, but not reckless. Here's the distinction: Risky is embracing uncertainty; reckless is rejecting ambiguity. Risky is growing increasingly mindful of how your pebbles ripple, reckless is remaining utterly unconcerned about the consequences of action. All I'm saying is: The less you know, the less you fear. And it’s a lot easier to break the limit when you don’t know the limit exists. At least that's what the officer told me. If you didn't know the ropes, would that give you permission to to fly? REMEMBER: Any idiot can be right. Only a real genius can embrace wrong. Pull a Steve Nash. Give not knowing a try. Because life is boring when you know all the answers.